Silver leaf is a fungal disease of the wood and leaves of some trees, especially plums, apples, apricots and cherries. The fungus infects the wood through wounds and causes a silvering of the leaves followed by death of the branch. Silver leaf is a fungal disease caused by Chondrostereum purpureum. It infects through wounds, mainly caused by pruning. Leaf silvering occurs during summer and fruiting bodies form from late summer. The most commonly affected trees are plums, apples, apricots, almonds, cherries and relatives, hawthorns, roses and poplars. Rhododendron and Laburnum are also attacked, though in neither of these does the silvering symptom develop in the leaves. Similar silvering symptoms may sometimes develop as a result of cold, drought or other non-disease forms of stress. This is known as false silver leaf and can be told apart from true silver leaf by the absence of staining in the wood. 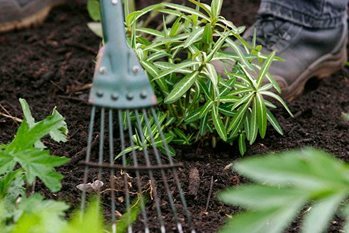 Since the fungus produces most of its infectious spores in autumn and winter, ideally carry out routine pruning of susceptible plants in summer. Not only are there fewer spores at this season but pruning wounds, the main point of entry for the spores, heal more quickly. Where silver leaf develops the affected branch should be removed as soon as possible, certainly before the fungal fruiting bodies appear. The branch should be cut off, where possible, at a point 10-15cm (4-6in) beyond the area where the staining in the internal tissues ceases. Cutting equipment should be disinfected regularly. Dispose of the pruned material immediately, as fruiting bodies will still form if it is left lying around. We no longer recommend binding, wrapping or painting pruning cuts as standard practice; the best thing is to let them heal naturally. However, where silver leaf is a recurring problem, painting wounds of susceptible trees might be the less harmful option. Laburnum, poplar, prunus and rhododendron are examples of susceptible plants where protective wound paints such as Growing Success Prune and Seal, Bayer Garden Arbrex Seal and Heal or Vitax Medo might be worthwhile. The airborne spores of this fungus are released from the bracket-shaped fruiting bodies found on dead branches. These spores infect healthy branches through wounds, especially pruning cuts. The fungus grows down into the wood and kills it, producing a dark stain. The silvery sheen in the leaves is caused by a toxin produced by the fungus and carried upwards in the sapstream to the leaves. This toxin causes the leaf tissues to separate, with the result that an airspace forms, giving the leaf a silvery look. The fungus is not actually present in the leaves, but shortly after the appearance of the silver colour, the branch dies. Fruiting bodies of the fungus grow out later from the dead wood and the cycle starts again. Spores are released mainly in the autumn and winter months under damp conditions. This is why it is always recommended to prune susceptible trees in summer when silver leaf spores are less abundant.